Oh no! Daniel is thrown into a lions' den---just for praying to God. Will he survive the night with all the lions? Find out in this Zonderkidz I Can Read! book for young readers. 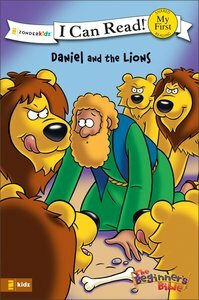 About "Daniel and the Lions (Beginner's Bible Series)"
There is no way out of the den. The lions roar at Daniel. All he can do is pray. Will God hear Daniel's prayers? 20 favourite Bible stories illustrated in the much-loved, vibrant Beginner's Bible art style in 3D. For that extra special bedtime charm, the padded cover is glow-in-the-dark! Each story is matched with a good night prayer for parents to say with their children.